Kik, the messaging service with more than 50 million registered users, has been vocal with its plans to introduce third-party games and content at some point, and now the moment has come after the Canada-headquartered startup quietly updated its iOS and Android apps to add stickers and its first third-party game (from Zynga). Rich-emoticon-like stickers are fast becoming a global craze, having netted Japanese app Line $17 million in revenue earlier this year, while Path has seen financial gains from stickers too. Social gaming platforms — which hook titles in to messaging apps to allow for multi-player games and social sharing — are also generating money, and Line’s own gaming service is a major reason it is tipped to make $85 million in revenue during Q2 2013. It isn’t just Line that is making money. Korea’s Kakao Talk grossed $311 million from games alone in the first half of 2013. These successes led Tango to become the first US-based messenger to introduce games in June, although Kik’s games platform is more open than to the others’ because it is HTLM5-based. Zygna, while a company in turmoil, remains a huge name in the mobile gaming space, and this is the first time that it has created a game for a mobile messaging platform, Kik confirms. Kik has provided its own games for some time, and titles from TreSensa, a one-year old company that specializes in HTML5 (cross-platform) games and recently raised a $1 million angel funding round, will come soon, according to the app update. The Zynga game is ‘One Word’, in which users solve word puzzles based on images. Scores and challenges can be shared with friends on Kik. It isn’t a blockbuster like other Zynga games, but it is an interesting partnership and the exclusivity hints at more releases in the future. Kik’s sticker shop is somewhat hidden and can be accessed within the emoticon section of a chat window. Currently the service offers three sticker packs, one for free and two others priced at £1.49 (it appears to be $1.99, but we can’t confirm US pricing just yet.) 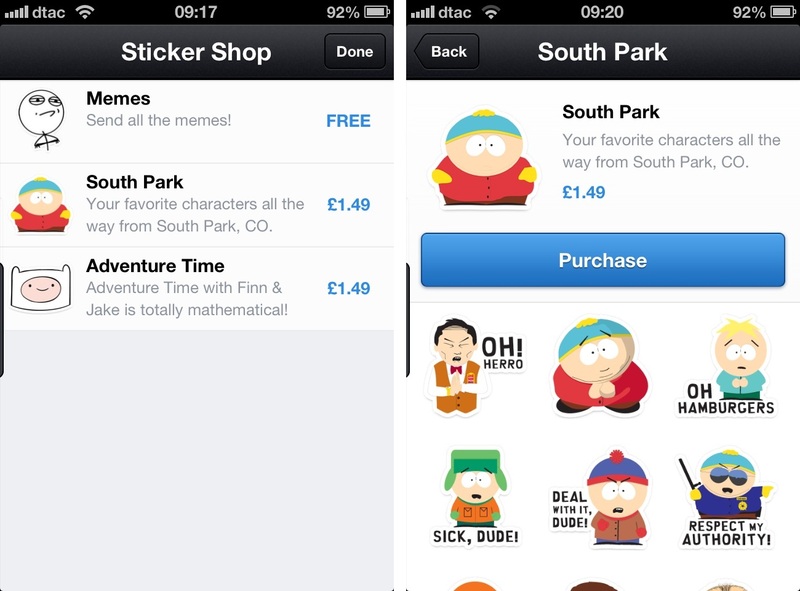 The sets include South Park, which look like another exclusive for Kik. Landing a Zynga exclusive is certainly a very interesting development. Zynga has made (and arguably lost, to a point) its fortune on social gaming, so its decision to explore messaging apps is a sizable validation for the industry as a content platform, and obviously also Kik as a service. The startup made a move towards games and content when it launched its HTML5 ‘Cards’ platform last November, allowing users to pull up YouTube videos, sketch, search images and more from inside the app. Speaking at the time, Livingston admitted the move was a first step towards finally monetizing the service. The success of Kakao Talk and our own game shows the potential. Every games company in the world has reached out to us, and we’re working with a number of gaming companies to build a mobile-only platform. April saw the company net $19.5 million in fresh funding to power its move into content, and we shall see how this is used to further today’s developments. With stickers and gaming primarily finding adoption and drawing revenue in Asia to date, it will be interesting to see how Kik’s user base — which is predominantly in North America and Europe — will receive the new features. Facebook added free stickers to its service this year, and it just launched a new program that sees it work closely with game makers on mobile.